How well up are you on Slovakia? Few football writers are as well educated on their subject as IBWM's latest correspondent. Please welcome Dan Richardson from the excellent Britski Belasi for an insight into Slovak football. The Slovak National Team certainly made an impact on world football this summer in South Africa dumping holders Italy out of the World Cup in dramatic style. Their 3-2 victory at Ellis Park Johannesburg was one of the most exciting matches of the tournament, and reaching the last 16 was an achievement way beyond expectations for the nation of 5.5 million people playing at their first ever major tournament. Slovakia has very little history of footballing success since independence from the Czech Republic in the ‘velvet divorce’ of 1993. In 1976, the former Czechoslovakia won the European Championships, and you have to go even further back for the last European success by a Slovak club side, Slovan Bratislava remarkably winning the 1969 UEFA Cup final against Barcelona in Basle, Switzerland. Since this summer’s World Cup, Slovakia has moved up to 27th in the FIFA rankings, 4 places above their traditionally more illustrious Czech neighbours. The victory over a distinctly average Italian team certainly shouldn’t be used to mask the limitations of the Slovaks, which were evident against New Zealand, Paraguay and Holland. However, Vladimir Weiss’ young team do have the spirit and ability to qualify for the next European Championships out of a group where their main rivals will be Russia and Ireland. 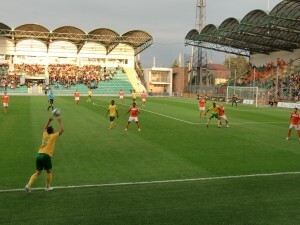 Slovak football fans will hope that the momentum generated by the success in South Africa will be carried forward into a highly accessible Euro 2012 in neighbouring Poland and Ukraine. In a country where ice hockey is the number 1 sport (Slovakia will host the 2011 World Championships), the game is in a constant struggle to win admirers, however in some towns, the signs are there that things might just be starting to change. After contrasting 1st leg results for the 2 Slovak club teams left in European competition, this is an excellent opportunity to reflect on the state of club football in one of the lesser-known leagues of Europe. While most of the stars of the National team are playing in the European big leagues, only one player from the squad is based at home, Kornel Salata the Slovan Bratislava defender. For Salata and the rest of Slovak football, the domestic season got underway several weeks ago already. UEFA currently allocate Slovakian clubs 4 European places, and the two lesser known entrants to the Europa League, FC Nitra & Dukla Banska Bystrica were pretty much out before the World Cup had even finished. Nitra lost to Hungarian neighbours Gyor and the Georgian outfit Zestafoni proved too strong for Dukla. These results are already a good indication of the lack of strength in depth in Slovak football. If you say you’re going to watch club football in Slovakia, most people will question your sanity. It is not so long ago that attendances in the top league were so low that gates were opened for free, and with an embarrassing shortage of stadiums, a football association often described as being incompetent and ongoing problems with crowd security, the domestic game in Slovakia certainly has a long way to develop. However, the outlook is not all bad, and there are several clubs who are working hard to make progress both on and off the field. The most prominent at the moment is MSK Zilina, last year’s Champions are on the brink of their first ever Champions League qualification and only the 2nd ever for a Slovak club side. Zilina have been quietly effective in Europe in the last couple of seasons and especially in 2008/09 performed impressively gaining 4 points from a UEFA Cup group containing Ajax, Aston Villa, HSV and Slavia Prague. They now have a huge opportunity to go one step further and the playoff against Sparta Prague is arguably the biggest fixture in the club’s history. Following Zilina’s victory over Bulgarian Champions Litex Lovech and Sparta’s defeat of Polish Lech Poznan, this was a relatively favourable draw for both sides on the Champions qualification route avoiding such potential opponents as Anderlecht & FC Basle. Sparta were favourites before the first leg, but Zilina also really fancied their chances. Coincidently, Zilina are coached by a Czech, Pavel Hapal, and Sparta by a Slovak, Jozef Chovanec. Zilina have 4 Czechs in their squad, and Sparta 3 Slovaks. So, with all of this background, no bigger reward than Champions League qualification, and just 400km separating the two cities, this is a highly intriguing fixture for followers of football in this region. The atmosphere in Zilina for this huge match will be exceptional; the match was sold out within hours of tickets going on sale. Also, uniquely, the match is being aired live throughout Europe on various TV broadcasters. This provides added incentive to players dreaming of moves to bigger leagues. Zilina’s 2-0 victory away from home in the 1st leg in front of a sell-out crowd including several hundred of their own vociferous supporters was, at times, classy and professional. Especially Zilina’s 6’5” Gambian striker Momodou Ceesay showed what a real gem he is at this level, and displayed many of the attributes which will inevitably attract interest from scouts from the bigger leagues, especially if Zilina progress to the Champions League group stages. His unique languid style, together with his strength and pace mean he is a real danger when running at defenders. He also has great shooting ability, can hold the ball up well for Zilina’s array of attacking midfielders to join the counter-attacks and is loved by the fans. Also 21-year-old goalkeeper Martin Dubravka showed experience way beyond his years and should have a bright future ahead of him. A strong team performance from Zilina coupled with some woeful play from Sparta led to a relatively comfortable victory in the 1st leg for the yellow and greens, much to the delight of the travelling masses. With some key players returning from suspension, Sparta should put up a better fight in the return leg this Wednesday. Zilina will need to be at their best again, keep their nerve and concentrate fully from the offset, however with the 2-0 advantage, the tie is obviously theirs to lose. Even if Sparta do score early, Zilina are more than capable of responding with plenty of attacking options throughout the squad. Several of their key players were rested in the 0-0 home league draw against FK Senica last Saturday and the feeling of anticipation in the North of Slovakia must be incredible. A potential €7 Million windfall in a country where most clubs dream of budgets over €1 Million and the possibility of hosting the biggest names in European football make this an exciting time for everyone associated with MSK Zilina. National coach Vladimir Weiss’ success story of taking Artmedia Petrzalka to 2005/06 Champions League qualification was short lived – the club has been relegated from the top division and is left with a derelict stadium and no fans. However, the MSK Zilina model is much more sustainable, they have a sound financial footing and the best ground in the country, one of the few where watching football is an enjoyable experience. The match against Sparta is providing a massive insight into the relative strengths of club football in these two countries where a domestic merger is a distinct possibility. Discussions, primarily focussed on convincing UEFA that a joint Czech-Slovak league would benefit the domestic game in both countries, are still ongoing. However, there is a strong belief that this league, consisting of 6 Slovak and 12 Czech teams could be up and running for the 2012/13 season. While European success arguably broadens the gap between the ‘haves and have-nots’ in the domestic league, for Slovak clubs like Zilina and Slovan Bratislava, it is essential in preparing themselves for a new level of football. Any question marks the Czechs might have over the strength of the Slovak league will be well and truly answered if Zilina prevail over the Czech Champions! In addition to MSK Zilina, there are a few other young teams on the scene in Slovakia slowly building themselves around strong youth systems with sound financial backing from local companies. MFK Ruzomberok’s main sponsor is a massive paper factory and they are currently holding their own in mid-table. Ruzomberok have a business and footballing plan in place, which centres on involving the whole community. They have an excellent youth system and offer reduced ticket prices for families. The ‘friendly’ club from a beautiful part of the country are targeting Europa League qualification in the near future. Spartak Trnava are a club with a big support and big plans, on paper. Whether the finance is in place to make the planned new stadium a reality remains to be seen. Perhaps entry to the new league is what is needed for Trnava to dream of a return to European football where they were so prominent in the early 70s. Vion Zlate Moravce were promoted last season and also have an impressive set-up. FK Senica, the team who merged with Inter Bratislava, retaining their place in the top flight, currently sit level with Slovan Bratislava and Spartak Trnava at the top of the league, just one point ahead of Zilina. All these teams will be aspiring to make the cut for the ‘Czechoslovak’ league and the Slovak game does provide a shop window for young players and players from other continents, especially Africa, looking for moves to the bigger leagues of Europe. With a few new stadiums and increased sponsorship and television coverage potentially being generated through the merger there is real scope for Slovak football clubs to develop while maintaining profitability from the sales of young players. Unfortunately the view from the bigger cities is perhaps not so rosy, and although Slovan Bratislava currently sit top of the table, serious problems with the stadium and crowd-related issues continue to affect the development of the capital’s top club. The 0-1 defeat to VFB Stuttgart was marred by ugly scenes on the terraces, and while it is easy to blame the hooligans, the situation is pretty much uncontrollable without a modern football stadium to host these big games. The result of failing to control the crowd in European matches usually results in a hefty fine from UEFA, and discourages people further from going to games which will only make the situation worse. This is proven by the attendance at Slovan’s last league game against Ruzomberok – just 1,285 people turned up compared to over 8,000 at the European games. Plans are in place for a new National stadium and home for Slovan at the site of the now closed Tehelne Pole, but government money set aside for this project has been used to help victims of serious flooding in the East of the country. Now the project appears to be frozen, there is no visible signs of progress, and the SFZ simply avoid questions on the subject. The same can be said of MFK Kosice, the club from Slovakia’s 2nd city who last year hosted Roma in the Europa League are now struggling at the bottom of the table and attract miserly crowds to their crumbling stadium. The Kosice stadium, along with Slovan’s temporary home, Pasienky, provide such stark comparison to the shiny new Ice Hockey arenas being built ahead of next year’s World Championships. At Kosice’s last home match against Spartak Trnava, away fans outnumbered the locals and once again, the headlines are describing serious violence inside and outside the ground. The doubters and critics of domestic football in Slovakia certainly have good reasons for complaint and you also can’t argue with the crowds staying away if security cannot be guaranteed at certain stadiums. The game in Slovakia obviously has more than it’s fair share of problems, which clearly need to be resolved. However, to end on a positive note, with several clubs already demonstrating the rewards of excellent youth systems and the possibility of a new exciting competition increasing sponsor and TV interest, Slovak football could be a real growth area in the coming years. This is a week that could significantly change the critic’s views and the immediate outlook for Slovak football. If MSK Zilina do overcome Sparta Prague and make it into Thursday’s Champions League draw, this achievement is arguably as impressive as the National team’s performance in South Africa and at least goes someway to putting the Slovak domestic game back on the European map. You can read more from Dan at his thoroughly excellent blog, Britski Belasi, here.